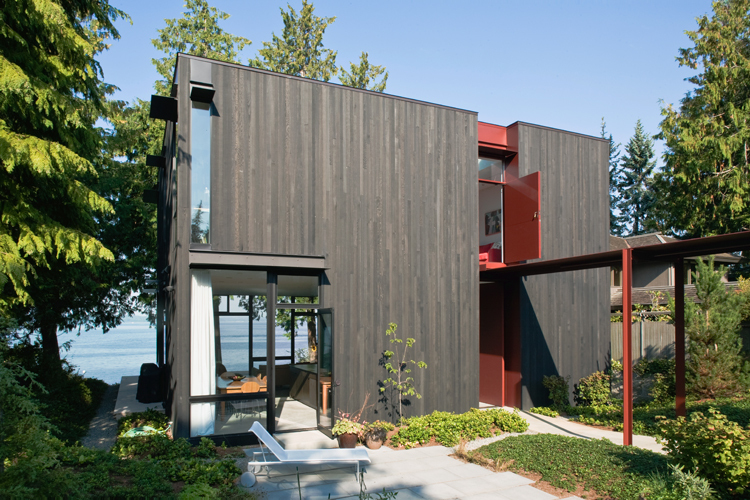 On the shores of the Puget Sound, Tom Kundig built a house that doubles as a private retreat and a place for entertaining. The two-story cedar-clad house is positioned to maximize water views and natural light, with custom hardware and steel accents designed by the architect. At just 350 square feet, this remote cabin with a view for the Sol Duc River sits on stilts to protect it from flooding and the dampness of the northwestern rainforest. Its shutters can be operated manually by custom steel rods. Olson Kundig Architects created Studhorse in Washington's remote Methow Valley as four structures oriented around a central courtyard, each positioned to best enjoy the surrounding vistas in all four seasons. In Seattle's rapidly developing South Lake Union neighborhood, the Art Stable is a classic example of urban infill. Built on the site of a former horse stable, the seven-story mixed-use building carries its history into the future with highly adaptable live/work units. On San Juan island, Pole Pass is an intimate waterfront retreat built to serve as a gathering space that takes advantage of the temperate Pacific Northwest summers. Seattle-based architect Tom Kundig, a principal of the design firm Olson Kundig, gets the monograph treatment in the new book Tom Kundig: Works (Princeton Architectural Press). The 300-page tome features 19 works by the architect, in cities from New York to Seoul and ranging from residences to museums and high-rises.